Tema Frank discusses her latest book, People Shock, and how to balance technology with process and people for a better customer experience. Tema Frank has worked in customer-experience related fields for over three decades. In 2001 she founded Web Mystery Shoppers Inc., the world’s first company to assess omnichannel customer service: web, phone, chat, email and in-store. Using social media techniques in the days before social media existed, she built a database of 75,000 “mystery shoppers” worldwide. Her clients have included Bank of America, the Royal Bank of Canada, ING Direct, Expedia, and many government and other organizations of various sizes. Her industry-leading research has been featured in the Wall Street Journal, the Globe & Mail and other business and academic publications. A best-selling author, her second book, PeopleShock: The Path to Profits When Customers Rule, comes out this fall. Based on interviews with over 150 executives, entrepreneurs and experts, it combines case studies, data and practical action steps for customer experience and business success in the digital era. Her podcast, Frank Reactions on Customer Experience, can be found in the usual places and at frankreactions.com. As we rely more on technology, we acquire new processes. And those processes often don’t translate to the ideal customer experience. 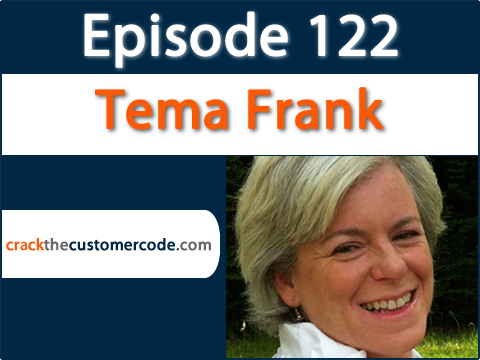 “IT does not think like customers,” says today’s guest, Tema Frank! And the evidence is all around us. Today, the best of intentions can lead to customer service disasters, simply because a set of processes has taken precedence over human interaction. Tema shares many ways you can help your own organization find the balance between people and process where tech is relied on heavily. She outlines a time-tested three-step process from her book, People Shock, to ensure your technology remains conducive to a terrific customer experience. How can you inspire senior executives to help keep your processes connected to the people they are designed for? Tema knows what it takes to strike a harmonious balance. How vulnerable will your organization be when the next underdog decides to “uberize” the experience in your industry? Listen in to keep your processes connected to the people who bring you profits.